We want you to enjoy life while crypto currency trading bots do the work for you. You create your portfolio the way you want. 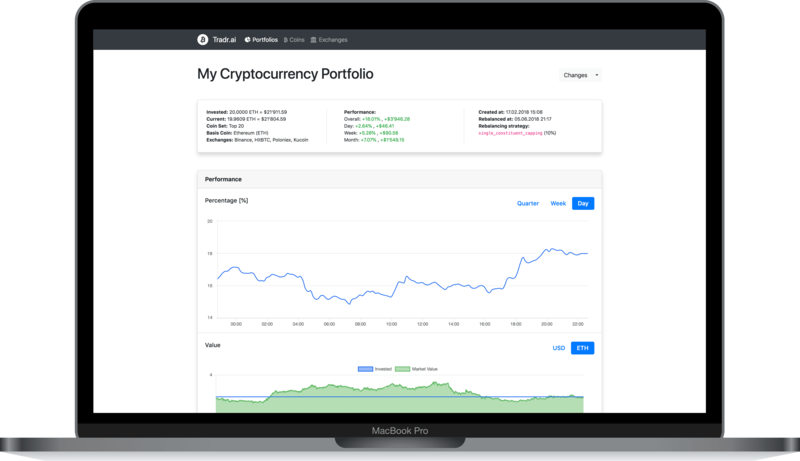 Select from a variety of different, predefined portfolio strategies and let bots do the trading for you. Track performance and get informed over your return on investment over time. Our AI powered trading bots will take care of your portfolio 24/7 to deliver the best results possible. Autonomous trading and rebalancing based on our AI trading algorithm. Choose from many different rebanlancing strategies. Select a portfolio type that best suits your investment type. Choose from a broad range of crypto exchanges or tell the bot to select the optimized cost model. Stay up-to-date with new features and releases as we publish them. Don't miss anything. Always be informed about the current crypto currency market prices. Enjoy life. Let Tradr.ai do the work for you.